We love OKIDO productions here at KBR, and this latest large format picture book is yet another riot of fantastical imagery and fun, all under the guise of education. Learning through fun? Yes, please! A cross between an activity book, reference book, info book and picture book, this hard cover tome is crammed with all manner of facts, figures and fun. Kids can learn how to build a house. They can learn how to save on waste. They can learn which objects are made of what materials, how machines work, how a book is made. They can even play a game that helps them understand how cogs work. Using multi-media elements like photography, graphics, illustrations and diagrams, even adults will be agog at the gloriously creative ideas and activities kids can really get their teeth into. 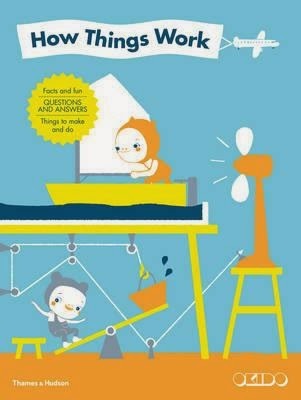 Ideal for very young kids, as information is carefully presented in a way that is cohesive and easy to understand. A focus on imagery makes it ideal for the younger set, too.